...and then life presents you a moment of unexpected joy. Although nothing when you focus your mind is unexpected. We bring about all that happens in our life by our thoughts...especially joy. Happiness, joy whatever you call it, arrives because you deserve it + if you make the space for it + believe in it, it will find it's way to you. By chance I stumbled upon a gloriously beautiful Hindu Holi Festival yesterday right around the block from my apartment. To myself I thought, I heart NY but that thought was quickly trumped by the thought, I heart life. There in a tiny park a hundred or so people had come together to share what can only be described as sheer joy. 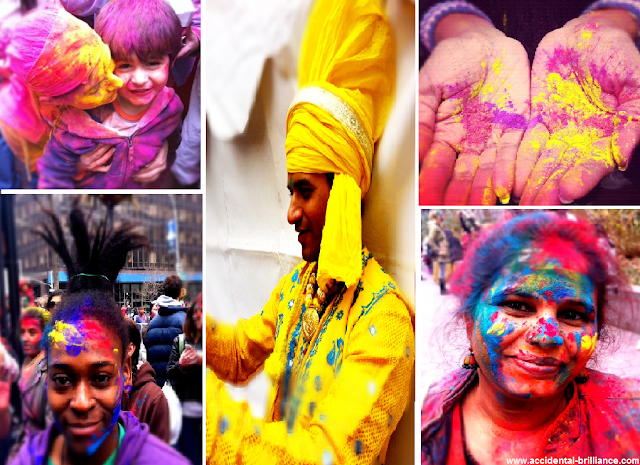 I have long been fascinated by the Holi Festival that is traditionally celebrated all over India, a yearly celebration to welcome Spring and also a chance to let loose. I could have stayed all afternoon taking photographs + can best describe it as an explosion of amazingly bright colored powder that symbolizes the beauty of life, the mystery of all that we can't explain but strongly feel...it is of happiness, rebirth + the magnificence of all the joy that is meant for each of us to experience each day.